Flights of Fancy: Fear is like a roller coaster! Fear is like a roller coaster! I had this long, deep conversation with Raghav again today about his fears.....something that has been hovering around us over the last couple of months. Raghav has been fearful of the fogging machine used to control mosquitoes, thieves breaking in, fire, and disturbing sounds and smells. It has been a harrowing and challenging experience for us, and something that we are digging into, finding our feet and our way, slowly and surely. The only thing we have done about this is to talk, talk and talk a lot.....sometimes I try to use humour to describe and work around it, while at other times I use logic to explain why and how something that he feared was most unlikely to happen, what we could do if it did and so on. For most of the time, we have been with the feelings he has had, acknowledged and tried to understand them, rather than brush them aside or distract him. While he continues to battle his fears, this is what he came up with and shared with me today - a beautiful allegory about his fear. "Amma....Fear is like a roller coaster actually. The more I try to push it away, like one of the cars going up a slope on the roller coaster, it comes back faster and with more force! 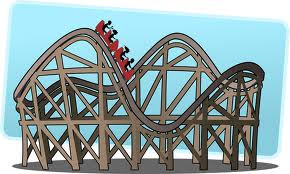 It goes away and comes back, again and again, just like in a roller coaster!" Perfect analogy! These days I reason with my own fears and those of Gautama's with this saying that goes through my head like a chant "on the other side of fear, is freedom"... Thanks Priya!